Robby's Automatic Positioner is specially designed so you throw your ball with precision accuracy and power. When set with the thumb on top of the ball, it produces the normal 11 o'clock - 5 o'clock position, enabling the ball to swing out in a true pendulum. Robby's Automatic Positioner is specially designed so you throw your ball with precision accuracy and power. When set with the thumb on top of the ball, it produces the normal 11 o'clock - 5 o'clock position, enabling the ball to swing out in a true pendulum. Does it have the metal rod? This will have a metal plate for extra support. 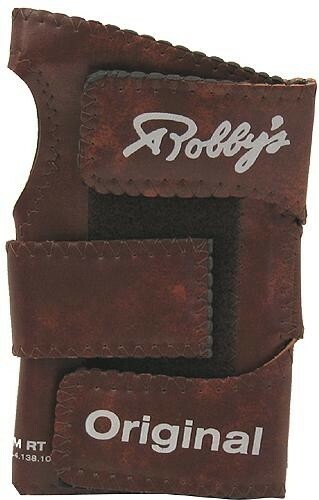 Due to the time it takes to produce the Robbys Vinyl Original Brown Left Hand ball it will ship in immediately. We cannot ship this ball outside the United States.